Amanda Williams is a public affairs specialist at Freer|Sackler, and the producer and creative force behind Asia After Dark. 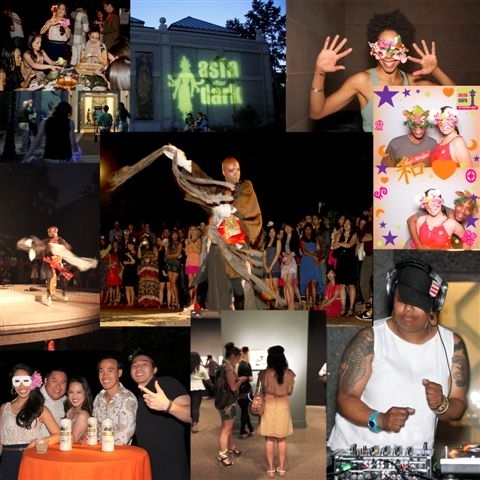 This past Saturday, Freer|Sackler kicked off its wildly popular Asia After Dark event series with a garden party featuring a mash-up performance of Japanese vogue dance, theater, storytelling, and hip-hop music choreographed by visual artist iona rozeal brown and performed by soloist dancer Monstah Black. Guests also created masks using Asian botanical symbols and Ashanti adinkra symbols from West Africa, enjoyed curator-led tours of Hokusai and Perspectives: Ai Weiwei, Afro-disiac cocktails and Sake YUM-YUM shots, a special Chuck Brown tribute, and lots of photo booth fun. The event was attended by more than 1,000 cultural revelers taking in all the excitement the evening had to offer, along with the perfect spring weather and almost full moon. Asia After Dark: Asian Soundcape returns on Friday, September 28, 7-11 pm, featuring a film soundtrack homage by acclaimed digital media artist and musician Paul Miller, aka DJ Spooky, and instrumentalists Danielle Cho and Jennifer Kim, set against an early silent film featuring Asian American pioneer actress Anna May Wong. Tickets on sale now at: www.asia.si.edu/asiaafterdark.